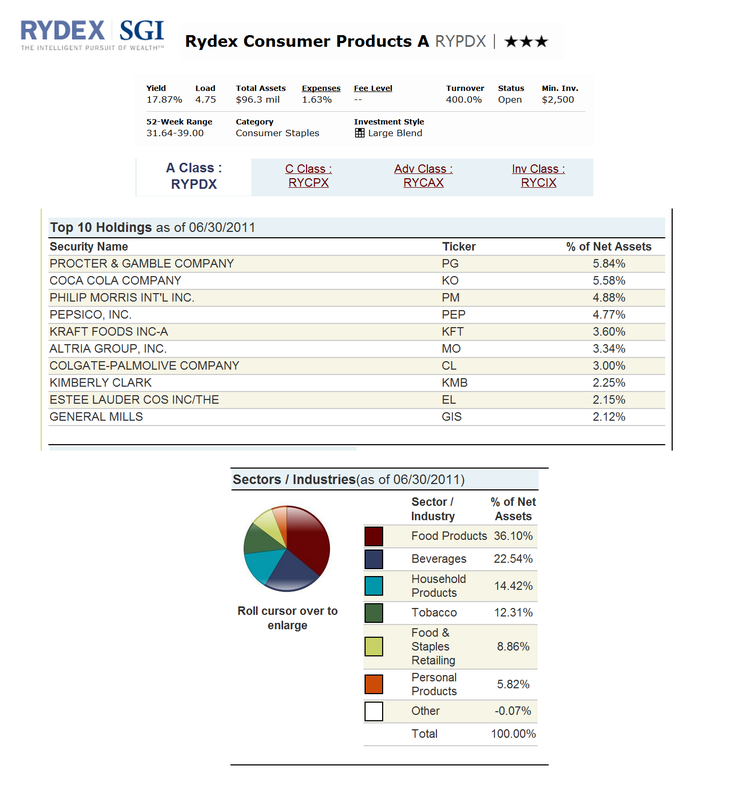 One of the best defensive sector equity funds is Rydex Series Trust Consumer Products Fund. As part of Consumer Staples sector equity mutual fund, this Rydex series fund invest in industry which produce or manufacture food / beverages, prescription drugs, tobacco, and other household products. The fund's review is described below. The Rydex Series Trust Consumer Products Fund objective is to achieve capital appreciation. The fund invests majority of its net assets (>80%) in equity securities of Consumer Products Companies that are traded in the United States and derivatives. Consumer Products Companies include companies that manufacture, wholesale or retail food, staple retail products and non-durable goods such as beverages, household, tobacco, and personal care products. It invests to a significant extent in the small to mid-sized capitalizations Consumer Products Companies stocks. The fund is non-diversified. Since March 2008, the fund has been managed by Ryan A. Harder. This Rydex fund has gotten 3-stars return rating from Morningstar. This consumer staples equity fund also has a net annual expense ratio of 1.63% which is a bit higher compared to the average in the Consumer Staples category (1.59%). This fund has a yield of 17.54%. The last dividend distributed was 0.10% in December 2009. It has 0.25% 12b1 fee and 4.75% front end sales load fee. To start investing in this best rated RYPDX fund, you will need a minimum initial investment of $2,500 for regular brokerage account and $1,000 for IRA account. This Rydex fund is available for purchase from 50 brokerages such as JP Morgan, Scottrade Load, Schwab Retail, Firstrade, Robert W. Baird & Co, Td Ameritrade Inc, Morgan Stanley Advisors, E Trade Financial, etc. Please check with your mutual fund broker for details. This fund is available in other classes, C Class (RYCPX), Adv Class (RYCAX) and Investor Class (RYCIX). The top 10 holdings of this fund as of June 2011 are Procter & Gamble Company (5.84%), Coca Cola Company (5.58%), Philip Morris International Inc (4.88%), Pepsico Inc (4.77%), Kraft Foods Inc (3.60%), Atria Group Inc (3.34%), Colgate-Palmolive Company (3.00%), Kimberly Clark (2.25%), Estee Lauder Cosmetics Inc (2.15%) and General Mills (2.12%). And the top sectors/ industries as of June 2011 are Food Products (36.10%), Beverages (22.54%), Household Products (14.42%), Tobacco (12.31%), Food & Staples Retailing (8.86%) and Personal Products (5.82%).